Got the MTM pale doll (strawberry blonde), to rebody my #98 Future Is Bright with. I hope they do return. IMO, I felt the closing of *all* its US stores was a mistake, and seemed more like they were cutting off their noses to save face, if you know what I mean. I see Walmart is trying to fill part of the void left by TRU. I don't think Garrett had anything to do with the reboot, as they went in a completely different direction. Making the dolls look younger, toning down the "scary" or "dark" themes, etc. Off Topic / Happy Birthday, Evilunicorn! Hope you have a fangtastic and memorable day! Off Topic / Re: Happy Birthday Lady Frostbite! The MM dolls are more big sister size. The joints snap off easily, and the legs are vinyl but don't click and hold a pose well. Bottom line, they're a great idea but poorly executed. I agree about the accessories. They already make them in doll scale, but it's usually "Barbie pink". There is one thing I'd like to see in (Barbie) doll scale, if they haven't already...a tractor. If they can make a Farmer Barbie doll, they can make a tractor for her to drive around in. Not the classic ones, but one resembling the newer models. Or maybe a barn or henhouse. I ordered Fresh Dolls Malik from their website. He was just too handsome to turn down, and we need more hunky AA dudes. 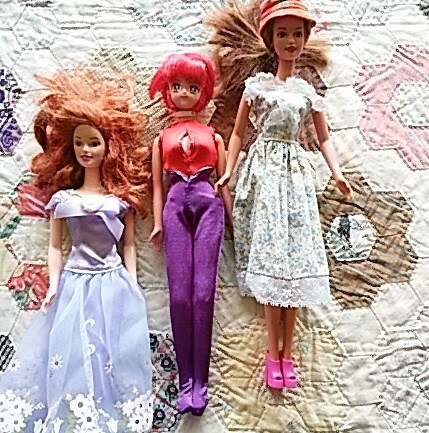 Off Topic / Happy birthday MonsterHighChecklist, unniedolls, ghostasaurusrex and KustomKara! May your day be filled with ghostly goodness and howling fun times! Curvy Barbie MtM...oh wait, they did that!